This vegan, gluten-free, dark cherry chia oatmeal is the perfect balance of tart and sweet with an encompassing scent of cinnamon that will satisfy for hours. Using frozen cherries, you can make this anytime of year and top with your favorite fresh or dried fruit. I love to use fresh blueberries and bananas with the addition of raisins for a chewy texture. With this recipe, you can skip the brown sugar entirely if you prefer low-sugar. 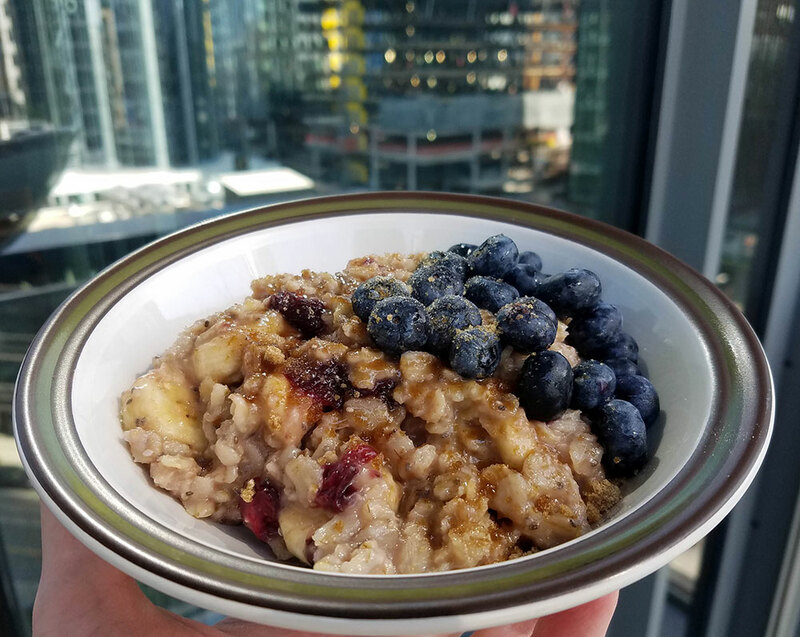 Normally, I'm not one to add sugar to my oatmeal as the banana adds natural sweetness, but I find with the tart cherries the brown sugar really makes all the difference to balance the flavors. Experiment with what works for you and tell me what you liked in the comments! Serves 1. Takes 10 - 13 minutes. I use organic ingredients whenever possible and I prefer Bob's Red Mill brand for oats. In a short stockpot, bring your water to a boil. Add oats, stir and reduce heat to a low simmer, cook for 10 -13 minutes or until most the liquid is absorbed but continuing with the following steps as your oats cook. Stir occasionally to avoid sticking. Meanwhile, slice half your banana and put it into the pot, mash with a wooden spoon (this adds a lot of natural sweetness to your oatmeal, and can reduce your need for extra brown sugar to offset the tart cherries). Place your frozen cherries in a small microwave safe bowl, cook for 20 - 25 seconds or until juicy and defrosted. Drain cherries from their juices using a fork, and slice each cherry in half (more juice will come out, that is fine). If using fresh blueberries, wash and drain well. When most the liquid has been absorbed by your oats and they are about 1 minute from being done, slice in the remaining half of your banana, add your cherries using a fork to avoid the excess liquid they released, and add your chia seeds, 1 tsp brown sugar, and cinnamon. Stir gently to combine and remove from heat. Pour oatmeal into a bowl, top with fresh blueberries, raisins and any more brown sugar on top to taste. Enjoy!